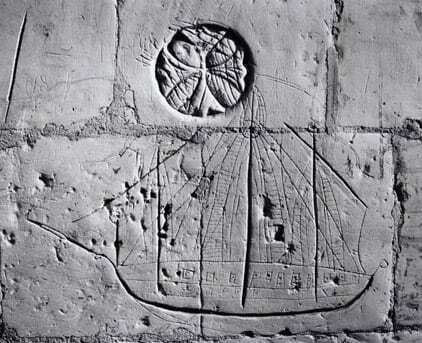 A royal castle in Berkshire may not seem the most likely place to find images of medieval ships but two such examples exist within the walls of Windsor Castle. The first, perhaps better described as existing on the walls of Windsor Castle, is believed to date from the late fifteenth or early sixteenth century. The image takes the form of a graffito or wall-drawing and may be a rare depiction of a balinger. Similar to a barge and carrying both oars and sails, such vessels were a common feature of medieval coastal shipping. The second image is a seal in the Archives attached to a document dated 1 April 1352 [SGC XV.55.59]. 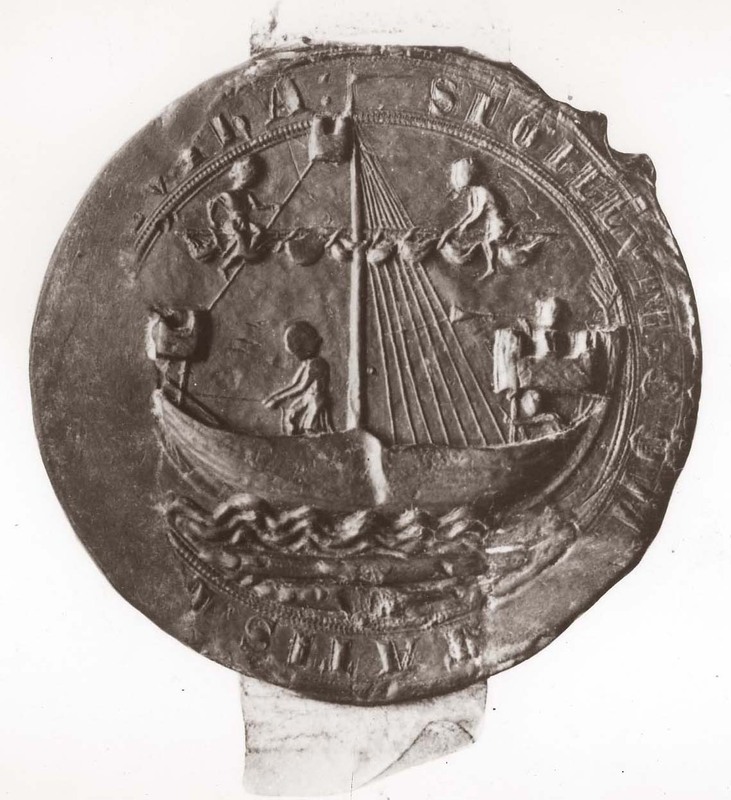 The double sided seal is made of green wax and is that of Yarmouth Borough. It shows men sailing a ship, two in the rigging and a third at the tiller. Maritime historians have long since found the image of interest due to the clear depiction of a ‘bowline led from the sail to the bow-spirit end’ [The Society of Friends of St George’s annual report, 1951]. The document to which the seal is attached is no less interesting and contains evidence of an unusual payment made by Yarmouth to the College of St George. Persuaded by Edward III, and apparently through a devotion to the Dean and College of St George, the Bailiffs and Commonalty of Great Yarmouth granted a last of red herrings, to be presented dry and cleaned, every St Andrew’s Day. This was a considerable gift when one considers that a ‘last’ contained between 10,000 and 13,200 fish. In the 17th century Canon Evans depicted a rather less pious explanation to the document. It seems likely that the annual payment was a punishment on the town for the murder of a Yarmouth magistrate. The payment continued for an extraordinary period of time. By 1718 the quality of herrings was such that the College began accepting money instead. It was only in 1867 when the Ecclesiastical Commissioners took control of the College’s property that the town quietly stopped the payment.